Join us for an unforgettable 7 Day safari where we explore the best that Kenya has to offer. Kenya has been one of the top African Wildlife destinations for a long time and on this particular safari we will visit the main destinations with the idea to get away from the crowds. We will focus on the personal touch and all the natural aspects of this beautiful and wildlife rich area and not just to chase after the big 5. As with all our safaris this itinerary can be tailor-made to suit your preferences. Morning departure from Nairobi, driving north to the dry & arid landscape of the Samburu Reserve. There is sparse vegetation and little game here, except for the broad swathe cut by the Uaso Nyiro River along whose banks, both game and vegetation flourish. Arrive at your tented camp in time for lunch and check in for a stay of 2 nights. The Samburu Game Reserve is home to different species of game, peculiar to the area – these include Grevy’s Zebra, Reticulated Giraffe, Beisa Oryx and Long-necked Gerenuk. Two nights will be spent here enjoying game drives in the Reserve. Depart from Camp after breakfast and drive back along the same road, to the Ol Pejeta Rhino Conservancy situated around the base of Mt Kenya. Lunch at the tented camp will be followed by a game drive in the Conservancy, to visit the Chimpanzees and the endangered species Boma. 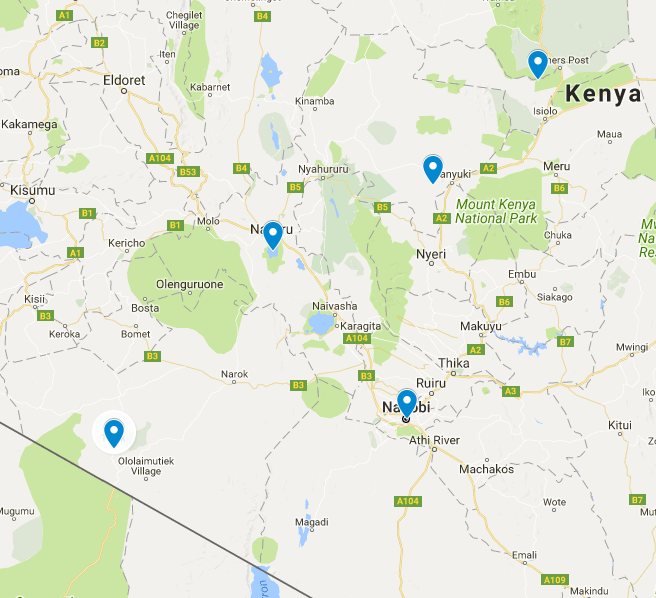 Today, you will drive into the Great Rift Valley, to one of the lakes on the valley floor, Lake Nakuru. The lake is host to a large number of Flamingos that gather at the water’s edge, giving the lake a pink hue when viewed from afar. Lunch at the Camp will be followed by a game drive in the park, together with a visit to the lake shore to see the Flamingoes. Return to Camp in the early evening. Drive across the vast floor of the valley, to the Maasai Mara Game Reserve, Kenya’s richest game park renowned for its black-maned Lions. You will arrive at your tented camp in time for lunch and an afternoon game drive in the Reserve. The next day, enjoy two game drives in the Reserve (one in the early morning and one in the late afternoon). Drive to Nairobi in the morning, arriving in the capital city in the early afternoon hours. Transfer to the airport for your international departure flight.